Very simple. Whether you are suffering from heartbreak or a breaking back, there are times when you aren't in the mood to eat nor cook. Opening a few cans may be all that you can handle, but you'll find this recipe is more than just a convenience. It's alchemy. You will be nourished and loved despite your best efforts to stay out of the kitchen. This soup is for you. In an extra large saucepan, warm olive oil with garlic and rosemary over low heat until fragrant and barely golden. Add tomatoes and broth, crushing tomatoes briefly with a potato masher. Increase heat to bring to boil. Reduce heat to simmer for 20 minutes. About 10 minutes into cooking time, boil pasta according to package directions. Drain pasta and add to soup along with chickpeas, stirring to combine. Return soup to simmer until chickpeas are hot (about 5 minutes.) Divide into 4 bowls. Top with Parmesan and optional red pepper. Serve immediately. Leftovers will thicken into stew while refrigerated. Dilute with 1 cup water, or heat and eat as is. This recipe is for Rachel of The Crispy Cook, hosting MLLA 20. Do stop by her site in early March for what will be a wonderful round-up. Since this dish has as much pasta in it as beans, I am also delivering it to Ruth of Once Upon a Feast hosting her Presto Pasta Nights #153, the third-year anniversary edition, of the noodle-rific weekly event which I had the pleasure of recently hosting and will be signing up to host again. No Croutons Required, the long-running and popular monthly vegetarian soup and salad event hosted by Lisa of Lisa's Kitchen, and Jacqueline of Tinned Tomatoes is featuring chickpeas this round. This soup's for them, too. Pasta. We love it, we crave it, we never get tired of it. Let's hear it for Ruth of Once Upon a Feast, creator of Presto Pasta Nights, for continuing to feed our enthusiasm with the wonder of what basically amounts to flour and water. Congratulations, Ruth, on hitting 150 weeks of wildly inventive recipes that never lose their power to derail a diet while they delight us. Thanks to all who participated. You are all amazing. macaroni covered in creamy aged and smoked cheeses. a sister-in-law who well knows how to be a good hostess. to our weakness for the novel in the familiar. 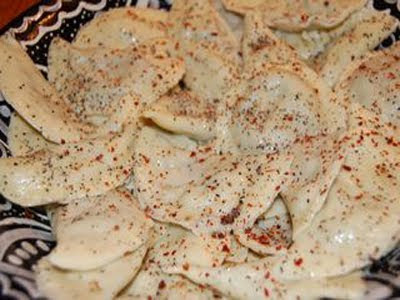 dumplings will have you singing for seconds. bellies and bones of guests enjoying winter hospitality. chooses to dine off chopsticks rather than the tines of a fork. and musky duo to dress up a gala plate of bow ties. Hawaiian dish that doesn't even allude to being named for them. a turn at homemade dough and mixed mushroom filling. what kind of pasta qualifies as cream of the comfy crop. 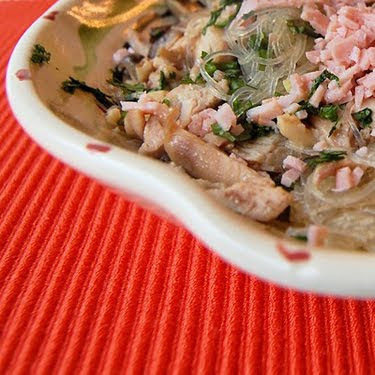 hearty meal of meats and cream for long winter nights. food community's commitment to end world hunger. on a plate of butterflies napped in butter, cream, and cheese. The hosting baton is now passed on to Mrs. Ergül of Passion for Life and Food, who will be presiding over Presto Pasta Nights #151. Do send your recipes over to her commencing now to ensure you will be included in next week's round-up on Friday, February 19. 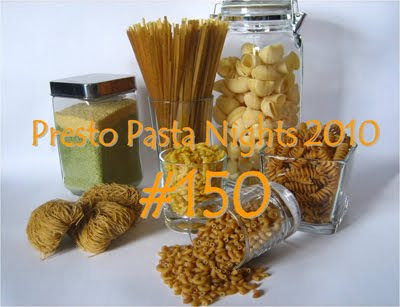 The Presto Pasta Nights Round-Up #150 is less than twenty-four hours away, still plenty of time for you to cook up something fabulous to share. Thanks to those who have already sent me your dishes. 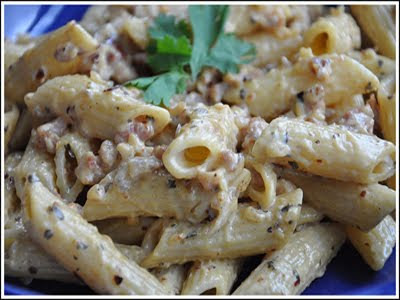 My contribution is an easy, dairy-rich recipe based on the classic Fettucine Alfredo. For those who want to cut back on the calories, you can omit the butter and substitute light cream or half and half for the heavy cream. 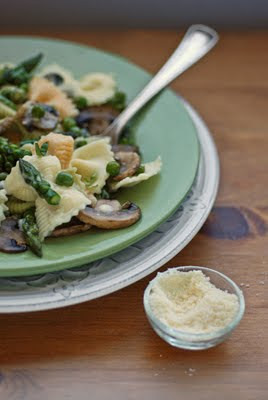 While mushrooms are cooking (total time about 7 minutes), prepare Alfredo sauce. In a large saucepan, heat the remaining 1 tablespoon olive oil over medium heat until thin (10 seconds). Add garlic and shallot, and sauté until they are golden and translucent (5 minutes). Add butter and allow it to melt before adding heavy cream and grated Parmesan. Stir to combine. Reduce heat to low. Let sauce come to a very slow simmer to thicken. Stir again, then keep warm on the lowest possible heat setting. It's my great privilege to announce that I am guest hosting Presto Pasta Nights for Ruth of Once Upon a Feast. PPN has been burning up the burners every Friday for the last three years. It's one of the easiest and most fun events to join. 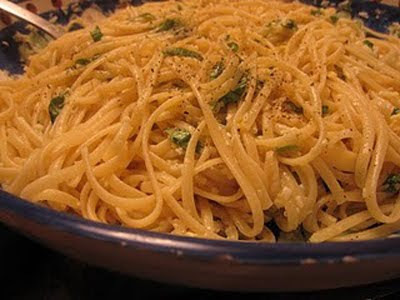 You hardly have to use your noodle except to whip up a pasta-based recipe in time for the round-up the evening of Friday, February 12. Please consult the simple rules, then send your details to me at the wellseasoned cook AT yahoo DOT com. 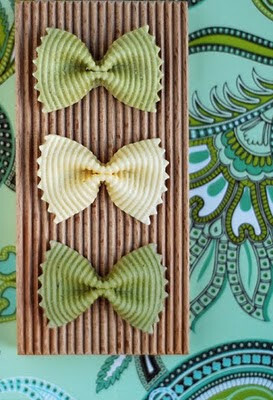 My own dish will be wearing bow ties, in honor of PPN #150, another milestone for those who are more than happy to count their carbs! Quick. What’s the busiest area of your supermarket? If your experience is anything like mine, it’s the deli department. No matter what time of day, there are invariably shoppers lined up against the long, gleaming glass case, tiny numbered tickets in hands, waiting their turn to peer in closer to pick from the dozens of cold cuts lined up inside. They may drive like speed devils and sigh as they check their watches when stuck in traffic, but there is never a more orderly nor patient crowd than customers who want their deli fix. It’s an American tradition. Nothing has changed since my German grandmother would wait her own turn at a small, old-fashioned neighborhood delicatessen. Every Saturday morning, between giving piano lessons, her ritual was the same: stop for a bagful of cold cuts and some pickles from the barrel. She would then head over to the bakery for an assortment of rolls and breads. Back at her charming little clapboard house, the lunch table was already set, and the coffee was ready to be poured. Serving was never formal, with sliced cheeses and meats splayed in brown paper wraps all over the wooden surface. Jars of mustard and other condiments were arranged in a cluster with the pickles. My mother tells me this was always the way of the household, even when she and her sisters were kids. Tradition is the cozy and secure tie that binds the generations, even when the world is wild with modern technologies. Macaroni and cheese is an American tradition, too. Is there any dish more comforting than a bowl of elbow noodles glowing in melted cheese under a mantle of crumbs? I’d like to survey the customers at the deli counter, to see what they’d think. They wouldn’t have to give up their sandwiches, either – not with the recipe I have created for the Wisconsin Milk Marketing Board: individual ramekins of Muenster and macaroni, flavored with mustard and bits of gherkin pickles, covered in fragrant caraway rye crust. Preparing homemade macaroni and cheese is a patient ritual, too. And a tradition worth waiting for. Wisconsin Muenster Cheese slices, milk, and butter. Toasting the caraway rye bread crumbs. In a blender or food processor, pulse the rye slices until even, soft crumbs form. (It may be necessary to do this in batches.) 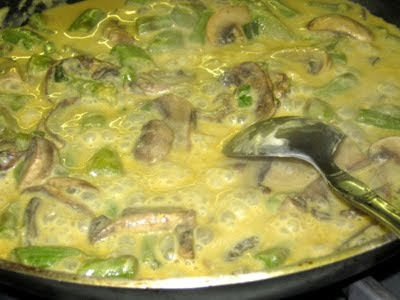 Melt 2 tablespoons butter in a large skillet over medium-low heat. Add bread crumbs and toss gently with a spoon to coat evenly with butter. Continue to toss crumbs and cook until they are lightly golden, barely crunchy, and the caraway seeds release their fragrance. Remove from heat and reserve. 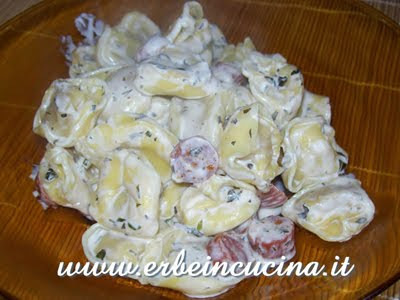 In a large pot of boiling water, cook elbow macaroni until just al dente (about 6 minutes). Do not drain yet, but turn off heat and let pasta sit in the hot water while you prepare the cheese sauce. In a medium saucepan, melt remaining butter over low heat. Sprinkle flour over butter and stir continuously with a spoon as the mixture forms a paste (known as a roux). Continue to stir and mash paste to cook the raw flour, about 2 minutes, then incrementally add milk, now stirring with a whisk after each addition. The paste will be lumpy at first, but will smooth and blend completely as long as you stir continuously. Once all milk is added, stir in chili powder, salt and ground pepper. 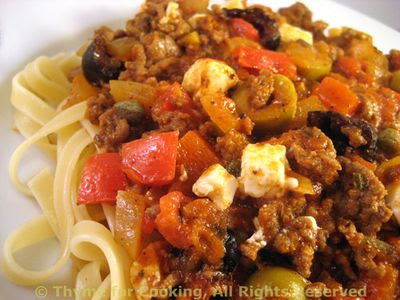 Increase heat to medium, and continue stirring until sauce starts to thicken, about 8 minutes. Reduce heat to low. Gradually add 8 ounces grated Wisconsin Muenster Cheese, stirring until fully melted after each addition. The sauce will be thicker (but still fluid) after all cheese is added, with a slightly melted-string consistency when you lift whisk from saucepan. Stir in mustard and gherkins. Turn off heat. Preheat oven to 375°F. Working quickly, drain macaroni in a large colander and rinse under hot tap water to remove extra starch. Drain well and return to pot. Stir hot cheese sauce thoroughly, then pour it over hot macaroni. Stir with a large spoon to evenly mix. Generously fill 1-cup capacity oven-safe custard cups, ramekins or miniature gratin dishes with the macaroni and cheese mixture. 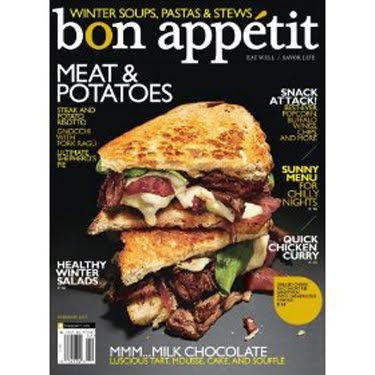 Top each serving with 1 slice Wisconsin Muenster Cheese, and then sprinkle with rye crumbs. Transfer dishes to a baking sheet, wiping up any scattered crumbs on sheet to avoid burning them. Position sheet on center rack of oven. Bake until cheese slices are melted and crumbs are well browned, about 15 to 20 minutes. Carefully remove from oven; ramekins will be very hot. Serve immediately. This post was commissioned by the Wisconsin Milk Marketing Board as part of their 30 Days, 30 Ways with Macaroni and Cheese. Do stop by their site for a creatively different macaroni and cheese recipe featured every day during this month-long event which kicked off on January 20 to celebrate National Cheese Lover's Day. I broke down and bought draperies, real draperies, the kind that sound-, air-, and lightproof the rooms to create a cocoon of silence, suffocation, and darkness. I do not like them; it now feels like we live in an antiseptic hotel, or worse, a funeral parlor. And yet, they are necessary. They are thermal lined for insulation. The Northeast's got a chill on, that despite a few days' worth of traditional January thaw, is back. I like the cold. A lot. But we woke to 12 degrees Fahrenheit the other morning, and the wind careening round the corners of our top-floor flat feels like it's scraping the bricks off the building. This cold has teeth. What we need here is something we have to wait months for, the polar, if you will, opposite of dead car batteries, black ice, and daggered icicles poised over doorways. What we need is summer, preferably the kind enjoyed in the Italian Mediterranean, where terra cotta walls radiate heat, geraniums radiate red, and fragrant pots of tomato sauce radiate from kitchen windows. Though terra cotta walls and geraniums, and even a kitchen window, are hard to come by at the moment, fragrant pots of tomato sauce are just about as easy as making cups of hot cocoa from scratch. The secret lies in flinging open the doors of your cupboards and fridge, and pulling out what happens to be on hand, what Simona of Briciole, mistress of Italian culinary and cultural linguistics, calls "aglio, olio e peperoncino," (garlic, oil, and red chili pepper), which are likely ingredients bound to be available no matter what. To many of us, a similarly simple sauce is more familiarly known as sugo alla puttanesca, named rather disparagingly after prostitutes or something of little value, from the word puttanata. But I beg to differ with the popular urban legend of it. Though this sauce is easy and fast, it can hardly be confused with cheap. No additional salt needed, especially if you add anchovies (2 tinned fillets, mashed in a mortar and pestle). Core tomatoes. Bring a large pot of water to a rolling boil. Add tomatoes to water, and reduce temperature to simmer. Watch for tomato skins to split and curl away, about 5 minutes. Remove tomatoes carefully from hot water onto cutting board. Allow to cool slightly, then peel tomatoes using a fork. Discard skins. 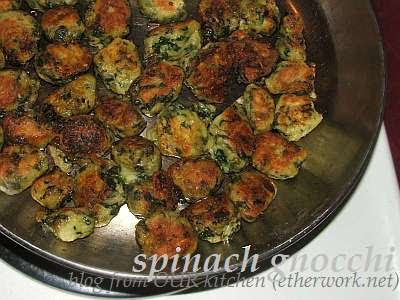 This post and recipe is, appropriately enough, being sent off to Simona of Briciole, hosting Weekend Herb Blogging #219 for Haalo of Cook Almost Anything at Least Once, who has assumed the leadership of this long-running event from its creator, Kalyn Denny of Kalyn's Kitchen.